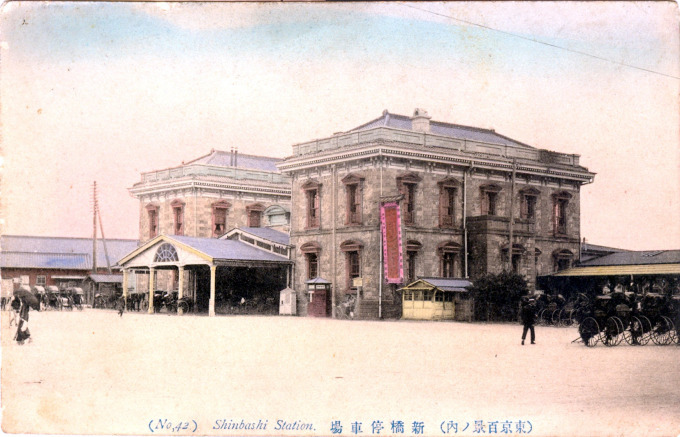 Japan’s first railway opened in June, 1872, connecting the new Tokyo capital with the port city of Yokohama. 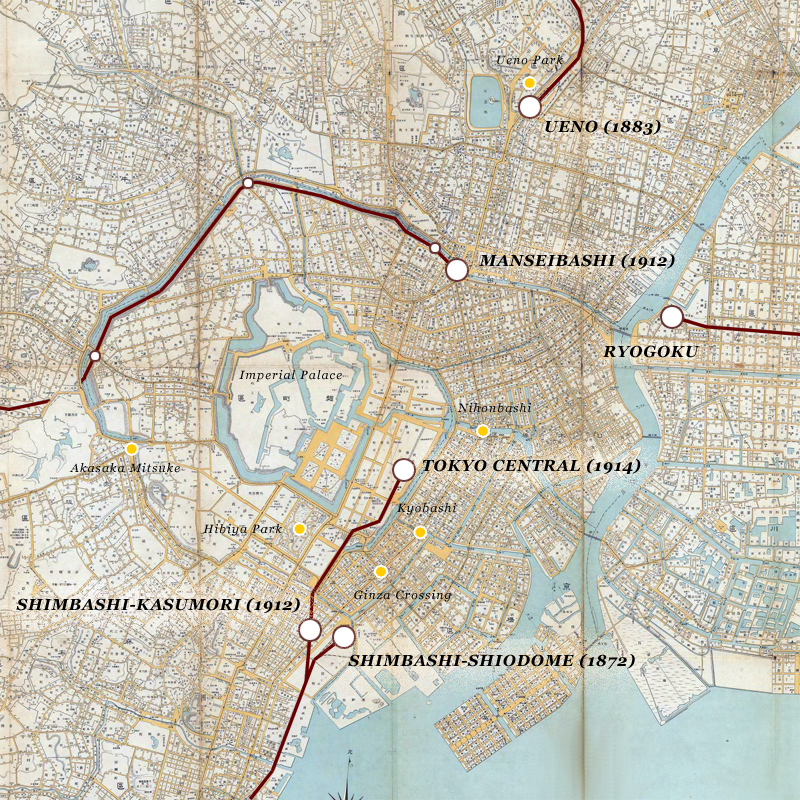 Initially, the line terminated to the north in Tokyo at Shinagawa. The General Staff would not allow track along the planned right-of-way facing Tokyo Bay (where several island forts were located), so a new embankment for the track was built. 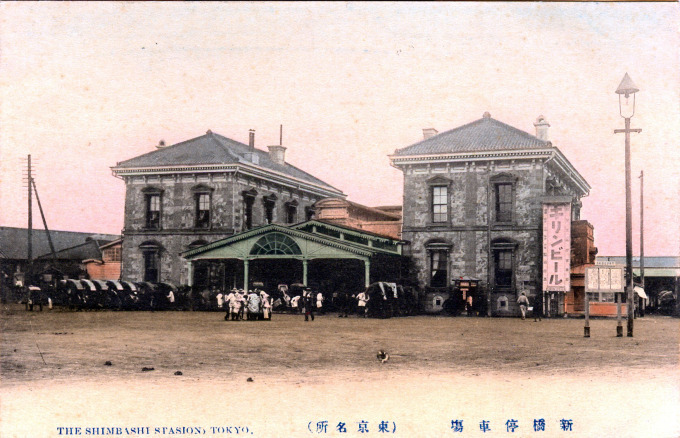 Tokyo’s new main terminal, Shimbashi Shiodome [tidal stop], opened on 14 October 1872 with a grand ceremony attended by Emperor Meiji who himself rode aboard the inaugural trip. Train service between the Shimbashi and Yokohama took 35 minutes, with stops at Shinagawa, Kawasaki, Tsurumi and Kanagawa before reaching the similarly-designed terminus at Yokohama Sakuragicho. Until the opening of Tokyo Central Station in 1914, Shimbashi Shiodome (and, from 1910-1923, Shimbashi Kasumori) also marked the northern terminus of the Tokaido Main Line that began express rail service between Tokyo and Kobe in 1889. “‘To Shimbashi, Shimbashi Station,’ cried Kohamma San. 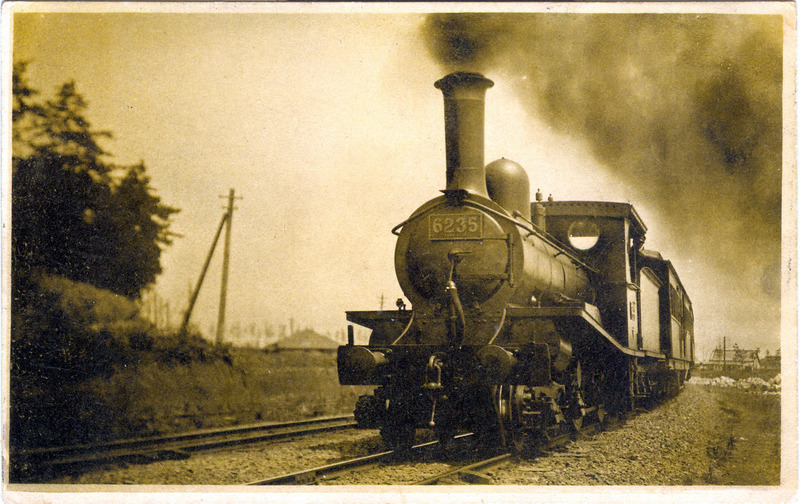 The 6200-class steam locomotives were British-built, and used for Tokaido Main Line service from 1898-1914. 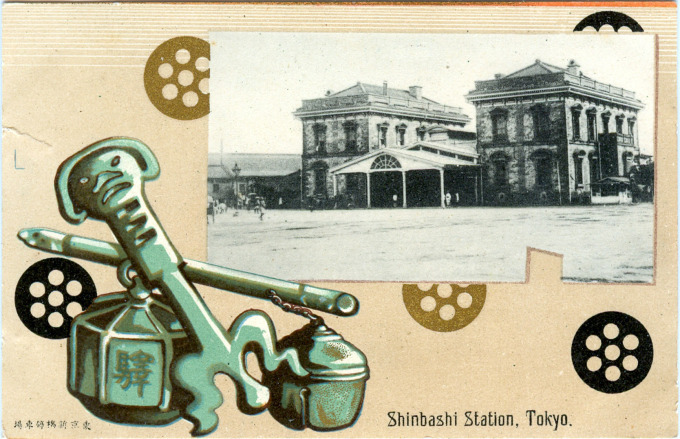 Shimbashi (Shiodome), in an art nouveau motif, c. 1910.